The International Seabed Authority (ISA) is developing regulations to control the future exploitation of deep-sea mineral resources including sulphide deposits near hydrothermal vents, polymetallic nodules on the abyssal seafloor, and cobalt crusts on seamounts. Under the UN Convention on the Law of the Sea the ISA is required to adopt are taking measures to ensure the effective protection of the marine environment from harmful effects arising from mining-related activities. Contractors are required to generate environmental baselines and assess the potential environmental consequences of deep seafloor mining. Understandably, nearly all environmental research has focused on the seafloor where the most direct mining effects will occur. However, sediment plumes and other impacts (e.g., noise) from seafloor mining are likely to be extensive in the water column. Sediment plumes created on the seafloor will affect the benthic boundary layer which extends 10s to 100s of meters above the seafloor. Separation or dewatering of ore from sediment and seawater aboard ships will require discharge of a dewatering plume at some depth in the water column. It is important to consider the potential impacts of mining on the ocean’s midwaters (depths from ~200 m to the seafloor) because they provide vital ecosystem services and harbor substantial biodiversity. The better known epipelagic or sunlit surface ocean provisions the rest of the water column through primary production and export flux (This was not the focus at this workshop as the subject was considered too large and surface discharges are unlikely). It is also home to a diverse community of organisms including commercially important fishes such as tunas, billfish, and cephalopods that contribute to the economies of many countries. The mesopelagic or twilight zone (200-1000 m) is dimly lit and home to very diverse and abundant communities of organisms. Mesopelagic plankton and small nekton form the forage base for many deep-diving marine mammals and commercially harvested epipelagic species. Furthermore, detritus from the epipelagic zone falls through the mesopelagic where it is either recycled, providing the vital process of nutrient regeneration, or sinks to greater depths sequestering carbon from short-term atmospheric cycles. The waters below the mesopelagic down to the seafloor (both the bathypelagic and abyssopelagic) are very poorly characterized but are likely large reservoirs of novel biodiversity and link the surface and benthic ecosystems. Great strides have been made in understanding the biodiversity and ecosystem function of the ocean’s midwaters, but large regions, including those containing many exploration license areas and the greater depths where mining plumes will occur, remain very poorly studied. It is clear that pelagic communities are distinct from those on the seafloor and in the benthic boundary layer. They are often sampled with different instrumentation. The fauna have relatively large biogeographic ranges and they are more apt to mix freely across stakeholder boundaries, reference areas and other spatial management zones. Pelagic organisms live in a three-dimensional habitat and their food webs and populations are vertically connected by daily or lifetime migrations and the sinking flux of detritus from the epipelagic. The fauna do not normally encounter hard surfaces, making them fragile, and difficult to capture and maintain for sensitivity or toxicity studies. Despite some existing general knowledge, ecological baselines for midwater communities and ecosystems that likely will be impacted by mining have not been documented. There is an urgent need to conduct more research and evaluate the midwater biota (microbes to fishes) in regions where mining is likely to occur. Deep-sea mining activities may affect midwater organisms in a number of ways, but it is still unclear at what scale perturbations may occur. The sediment plumes both from collectors on the seafloor and from midwater discharge will have a host of negative consequences. They may cause respiratory distress from clogged gills or respiratory surfaces. Suspension feeders, such as copepods, polychaetes, salps, and appendicularians, that filter small particles from the water and form an important basal group of the food web, may suffer from dilution of their food by inorganic sediments and/or clogging of their fragile mucous filter nets. Small particles may settle on gelatinous plankton causing buoyancy issues. Metals, including toxic elements that will enter the food web, will be released from pore waters and crushed ore materials. Sediment plumes will also absorb light and change backscatter properties, reducing visual communication and bioluminescent signaling that are very important for prey capture and reproduction in midwater animals. Noise from mining activities may alter the behaviors of marine mammals and other animals. Small particles have high surface area to volume ratios, high pelagic persistence and dispersal and as a result greater potential to result in pelagic impacts. All of these potential effects will result in mortality, migration (both horizontal and vertical), decreased fitness, and shifts in community composition. Depending on the scale and duration of these effects, there could be reduction in provisioning to commercial fish species, delivery of toxic metals to pelagic food webs and hence human seafood supply, and alterations to carbon transport and nutrient regeneration services. After four days of presentations and discussions, the workshop participants came to several conclusions and synthesized recommendations. 1. Assuming no discharge in the epipelagic zone, it is essential to minimize mining effects in the mesopelagic zone because of links to our human seafood supply as well as other ecosystem services provided by the mesopelagic fauna. This minimization could be accomplished by delivering dewatering discharge well below the mesopelagic/bathypelagic transition (below ~1000 m depth). 2. Research should be promoted by the ISA and other bodies to study the bathypelagic and abyssopelagic zones (from ~1000 m depths to just above the seafloor). It is likely that both collector plumes and dewatering plumes will be created in the bathypelagic, yet this zone is extremely understudied and contains major unknowns for evaluating mining impacts. 3. Management objectives, regulations and management actions need to prevent the creation of a persistent regional scale “haze” (enhanced suspended particle concentrations) in pelagic midwaters. Such a haze would very likely cause chronic harm to deep midwater ecosystem biodiversity, structure and function. 4. Effort is needed to craft suitable standards, thresholds, and indicators of harmful environmental effects that are appropriate to pelagic ecosystems. In particular, suspension feeders are very important ecologically and are likely to be very sensitive to sediment plumes. They are a high priority for study. 5. Particularly noisy mining activities such as ore grinding at seamounts and hydrothermal vents is of concern to deep diving marine mammals and other species. One way to minimize sound impacts would be to minimize activities in the sound-fixing-and-ranging (SOFAR) channel (typically at depths of ~1000 m) which transmits sounds over very long distances. 6. A Lagrangian (drifting) perspective is needed in monitoring and management because the pelagic ecosystem is not a fixed habitat and mining effects are likely to cross spatial management boundaries. For example, potential broad-scale impacts to pelagic ecosystems should be considered in the deliberations over preservation reference zones, the choice of stations for environmental baseline and monitoring studies and other area-based management and conservation measures. 7. Much more modeling and empirical study of realistic mining sediment plumes is needed. Plume models will help evaluate the spatial and temporal extent of pelagic (as well as benthic) ecosystem effects and help to assess risks from different technologies and mining scenarios. Plume modeling should include realistic mining scenarios (including duration) and assess the spatial-temporal scales over which particle concentrations exceed baseline levels and interfere with light transmission to elucidate potential stresses on communities and ecosystem services. Models should include both near and far field-phases, incorporating realistic near field parameters of plume generation, flocculation, particle sinking, and other processes. It is important to note that some inputs to these models such as physical oceanographic parameters are lacking and should be acquired in the near-term. Plume models need to be complemented by studies to understand effects on biological components by certain particle sizes and concentrations. Front row left to right: Jeff Drazen, Pierre Dutrieux, Les Watling, Astrid Leitner, Emily Young, Verena Tunnicliffe. Second row: Chris Measures, Mariko Hatta, Jessica Perelman, Erica Goetze, Jen Durden, Celine Taymans. Third row: Hiroyuki Yamamoto, Kristina Gjerde, Paul Hill, Amanda Ziegler, Chris Hauton, Tracey Sutton. Back row: Steve Haddock, Malcolm Clark, Tom Peacock, Tony Koslow, Craig Smith. Not Pictured: Whit Au, Jesse Black, Frank Parrish, Aude Pacini. Jeffrey Drazen (U. of Hawaii, jdrazen@hawaii.edu), Deep-sea physiological ecologist specializing in energetics and trophic ecology. Working to characterize scavenger communities in the CCZ. Jennifer Durden (U. of Hawaii, jdurden@hawaii.edu), Abyssal benthic community ecologist with experience in environmental policy for deep-sea mining, currently working on characterizing the benthic communities of the western CCZ. Pierre Dutrieux (Columbia LDEO, pierred@ldeo.columbia.edu), Ocean physicist with broad interests in ocean dynamics and its interactions with the atmosphere from the tropics to the poles. Jessica Perelman (U. of Hawaii, jnperelmn@hawaii.edu), Midwater ecologist characterizing vertical migration and deep scattering layer dynamics across the CCZ. suggest future directions for environmental research, management and policy. Deep-sea mining activities will have a variety of potential effects on biological communities including the ocean’s midwaters or pelagic realm ( Fig. 2 ). Mining strategies vary, but in all cases, the seafloor extraction, transport to the surface, and separation of ore-bearing materials will result in plumes of sediment released into the water column ( Levin et al. 2016 , Wedding et al. 2013 ). Within the Clarion-Clipperton Zone (CCZ), the expected decadal duration of activities and large areas of the seafloor likely to be mined means that sediment discharge volumes will be substantial and will likely extend throughout the water column, albeit with intensity varying by depth. In the deeper portions of the water column where current velocities are low ( Gardner et al. 1984, Leitner et al. 2017 ), fine abyssal sediments may be slow to settle, thus spreading over hundreds of kilometers from the discharge point ( Rolinski et al. 2001, Segschneider and Sündermann 1998 ). In contrast to the abyssal plain, sediments at seamounts and mid-ocean ridges may be coarser or at least more varied, and current regimes could be more dynamic depending on depth and location. The principle midwater ecosystems across depth and some pertinent characteristics of each. It is important to consider the ocean’s midwaters because they provide vital ecosystem services. The better known epipelagic, or sunlit surface ocean, provisions the rest of the water column through its primary production. The epipelagic is also home to a diverse array of commercially important fishes such as tunas, billfish, and cephalopods supporting the economies of many countries ( FAO 2016 ). 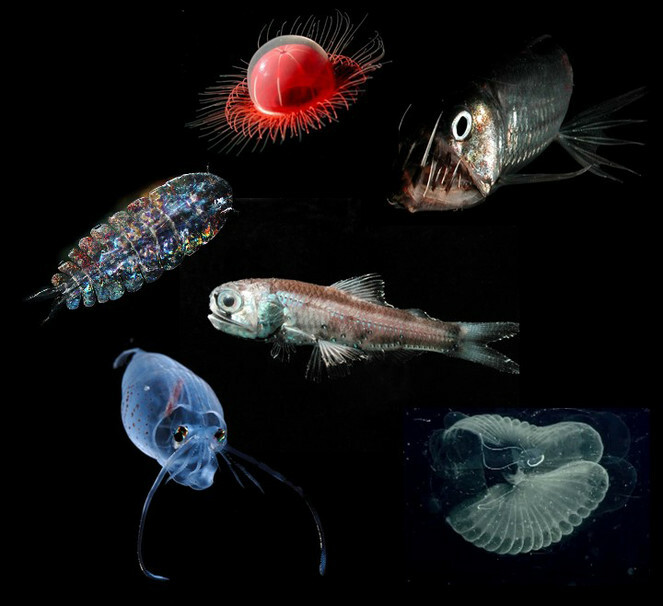 The mesopelagic or twilight zone is dimly lit and home to a very diverse community of organisms ( Fig. 3 ). Mesopelagic plankton and small nekton form the forage base for several marine mammals and many of the commercially harvested epipelagic species during their deep diving activities ( Abecassis et al. 2015, Choy et al. 2013, Olson et al. 2014, Choy et al. 2016 ). Furthermore, detritus from the epipelagic zone falls through the mesopelagic where it is either recycled, providing the vital process of nutrient regeneration, or it sinks to greater depths sequestering carbon from short-term atmospheric cycles ( Buesseler et al. 2007, Robinson et al. 2010 ). The waters below the mesopelagic down to the seafloor (both the bathypelagic and abyssopelagic) are very poorly characterized but are likely large reservoirs of novel biodiversity ( Robison et al. 2010 ). Clockwise from top left: Benthocodon jelly credit MBARI, Viperfish credit Jeff Drazen, Lanternfish credit Jeff Drazen, Appendicularian and mucus house credit MBARI, Cranchiid squid credit MBARI, Sapphirina copepod credit Erica Goetze/Katja Peijnenburg. Great strides have been made in understanding the biodiversity and ecosystem function of the ocean’s midwaters (e.g. Gloeckler et al. 2018, Irigoien et al. 2014, Priede et al. 2013, Sutton et al. 2017 ), but large regions, including greater depths where mining plumes will occur, remain poorly studied ( Webb et al. 2010 ). Research projects in mining regions have investigated the biodiversity and ecosystem function of benthic communities ( Amon et al. 2016, Gollner et al. 2017, Schlacher et al. 2013, Vanreusel et al. 2016, Leitner et al. 2017 ), but almost no effort has focused on the water column above. Programs such as MARECO provided new insights into deep pelagic community structure over the mid-Atlantic Ridge (e.g. Priede et al. 2013, Sutton et al. 2008 ) and some research has been done on seamount pelagic communities ( Morato et al. 2010 ) with a focus on top predators and fisheries. There have been a few studies of pelagic fauna in the benthic boundary layer of the CCZ (e.g. Dahlgren et al. 2016 ), and water sampling from the surface to the seafloor (on seafloor focused cruises) has provided some information on surface phytoplankton and microbial communities ( Lindh et al. 2017, Shulse et al. 2016, Zinssmeister et al. 2017 ). Also, there are studies of abyssal larvae and holoplankton on mid-ocean ridges (e.g. Mullineaux et al. 2010 ) and one from the abyssal CCZ ( Kersten et al. 2017 ). Though these studies provide useful information, they are location, taxa and/or size class specific and provide only a patchy view. They are inadequate for establishing ecological baselines for the midwater ecosystems likely to be impacted by mining. Furthermore, pelagic communities are distinct from those on the seafloor and in the benthic boundary layer, are often sampled with different instrumentation, and are more apt to mix freely across stakeholder boundaries. Hence, there is an urgent need to further evaluate the midwater biota in regions where mining is likely to occur, and this led to the organization of the workshop. During this workshop we evaluated the potential water column effects of deep seabed mining. The focus was on depths below the epipelagic, given that mining discharges at the surface are considered unlikely, and to keep the subject manageable in scope. Seabed mining targets and associated ecological communities are diverse. Based on likely near-term mining targets this workshop focused on three main habitats: mid-ocean ridges and back arc basins where hydrothermal venting creates massive sulphide deposits and mining has or will start in the immediate future, the CCZ where manganese nodule mining is anticipated to begin in the next 5-10 years, and seamounts where cobalt crusts are the targets of mining exploration activities. Exploration claims exist with the ISA in all three habitat types. To frame our discussions and share knowledge about the subject of deep seabed mining, each participant presented a short summary of their research area as it pertains to deep seabed mining on the first day (with 4 presentations on the second day). We then discussed a series of questions (given in the report below) as an outline to frame the overall discussion on the topic. To further facilitate participation we broke into groups to answer these. It was decided that we would divide many of the questions by mineral/habitat type – massive sulphides at vents, cobalt crusts at seamounts, and polymetallic nodules on the abyssal plain. At the end of each breakout session, the groups reconvened and rapporteurs and discussion leaders presented the findings to the larger group. We strove to generate consensus answers to each question that reflect the state of scientific knowledge. In addition, we had several large group discussions on the topic of dissolved plumes and on the ISA draft exploitation regulations and policy advice. The workshop participants considered a number of deep-sea mining scenarios and a variety of comments about such scenarios are included in the report below. In general and to provide context for our discussion and evaluation of environmental effects the general mode of ore extraction is briefly outlined here. We understood that actual mining scenarios may vary though were likely to be similar to the following general situation. For CCZ mining seafloor collector vehicles will remove sediment with the nodules that will then be hydraulically lifted up a riser pipe (or perhaps via line buckets) to a surface ship. This activity would occur over large areas of the seafloor. There the ore would likely be separated from seawater and sediment, with the ore transferred to carrier vessels and the seawater and sediment discharged via a pipe into the midwaters or back to the deep seafloor ( Oebius et al. 2001 ). Massive sulphide mining at vents has more developed technology with vehicles built by Nautilus Minerals (http://www.nautilusminerals.com) and the Japanese having already conducted test mining off Okinawa (go.jp/english/press/2017/0926_004.html). In these cases, mining might occur in relatively small areas where sediment overburdens would be removed and the ore below would be ground by mining vehicles and collected by another vehicle for hydraulic lifting to a surface ship. Separation and filtration of the material would occur on the ship with sediment and water discharged back to the deep water column or seafloor. Cobalt crust mining is the least conceptually developed and it was thought that this mining might occur in a similar fashion to that on seamounts except that the activity would occur over larger spatial scales due to the distributed nature of the crust. Breakout sessions and discussions were centered on each question in the workshop outline. Sub-questions were provided to guide the conversations if needed but were not always addressed explicitly. To facilitate full participation, it was decided that we would divide many of the questions, but not all, by mineral/habitat type – massive sulphides at vents, cobalt crusts at seamounts and polymetallic nodules on the abyssal plain. We broke into subgroups for each. Summaries of these discussions follow. What can we extrapolate based on studies from elsewhere? How similar are these characteristics between the 3 main mining ecosystems – abyssal plains, seamounts/ridges, and vent regions? The hydrodynamic regime of any mined habitat is extremely pertinent to deep-sea mining because it will partly dictate the spatial and temporal extent of sediment plumes. Generally, hydrodynamic processes (advection, mixing, upwelling, eddy diffusivity) in the shallower portions of the water column (surface to ~1000 m) are better known than in the bathypelagic or benthic boundary layer (BBL). An exception may be the dynamic equatorial region where repeated broad surveys revealed a circulation dominated by slowly evolving jets ( Cravatte et al. 2017 ) and large intra-seasonal to interannual fluctuations in the form of eddies and equatorial waves (e.g. Kessler and McCreary 1993, Marin et al. 2010 ). There have also been a number of studies using drifters below 1000 m in and near the CCZ (WOCE Subsurface Float Data Assembly Center Woods Hole, Mass. ; http://wfdac.whoi.edu/table.htm). Generally, however, hydrodynamic characterization in the bathypelagic, especially below 2000 m, is a major knowledge gap. Water column characteristics, hydrodynamics as well as nutrients, chemistry, and suspended particle background levels, are relatively homogenous at the mesoscale level and could reasonably be extrapolated at scales of 10-100 km in abyssal regions. However, it is clear that a full dynamic characterization of physical advection and eddy diffusion regime is needed throughout the water column from the surface to the seafloor. The few surveys covering the entirety of the water column have been limited to single repeat lines prone to aliasing spatial and temporal complexities (e.g. Firing and Lukas 1985 ), and those observations covering broader spatial and temporal scales, like satellites (e.g. Chelton et al. 2007 ) or ARGO float programs, clearly indicate large variations in both those dimensions. In turn, the lack of bathypelagic and abyssopelagic observations make it difficult to evaluate state-of-the-art ocean numerical models. For instance, the fact that only a few models represent mean jets or eddy energy levels recorded in anecdotal surveys indicates that caution is warranted in their use to infer tracer diffusion. Near the seafloor, bottom topography is a strong determinant of flow regimes. Importantly, there are many seamounts (rising >1000 m about the surrounding plain) and smaller hills across the abyssal plain of the CCZ, some reaching 3000 m above the abyssal plain. From studies of seamounts in shallower waters (see seamount section below), we know that flows will be affected and we can expect that local hydrodynamic conditions will vary substantially around hills and seamounts. There was some discussion about how best to characterize the hydrodynamics of a mining region given that there are gaps in our knowledge at the scales required in almost all cases. For the CCZ region, it was concluded that the most revealing and constraining method for physical characterization would be two repeated synoptic latitudinal sections of vertical profiles across the region. Such an approach would characterize a large amount of the physics. Fixed instrument moorings would provide information on temporal dynamics (seasonal to interannual time scales), if embedded in a larger program, including modeling, to characterize the regional hydrodynamics. Given the immense size of the CCZ and its variation from gyre circulation features to the north and equatorial influence to the south, a number of moorings across the region were deemed necessary. However, the location and number of such moorings needed to provide high resolution data should be determined by first creating a regional circulation model and identifying the zones of greatest dynamic importance. Gliders were also discussed as an effective way to survey large areas, measuring basic properties such as turbidity, turbulence, and currents. The working group discussed the importance of integrating existing and new data into models of physical circulation. Such models should include a region much larger than a single mining site or license area if the plume is expected to expand beyond this region. Although it does not currently exist, an important goal would be to create a more generic base model for the CCZ region that can be manipulated site-specifically by each contractor or party interested in a particular site or mining area. Further, physical models should integrate chemical properties (dissolved and particulate) with optical properties since these have a great influence on biological communities (see below). It was noted that the currently supplied EIA template lacks a great amount of detail on modeling. In particular, it was noted that contractor efforts thus far have focused on the near seafloor environment; however, to develop an understanding of both benthic and dewatering plumes, hydrodynamic measurements and modeling from 200-4000 m in the water column will be required. Furthermore, the ISA should encourage contractors to construct comparable models because the CCZ is a HUGE region that will benefit from an integrated approach. To characterize the chemical environment, knowledge of the distributions of dissolved nutrients, oxygen, and metals, as well as redox chemistry (including pH), will be needed to evaluate baseline conditions and mining effects. Mining will lead to fragmentation of nodules during the processes of separation from sediments and hydraulic lifting to the surface. Nodule surfaces that have long been in contact with water are in steady state, but newly exposed fractures have the potential to mobilize chemical constituents and allow for reactions. The GEOTRACES program has provided substantial general information about the distribution of many trace elements and metals in the various ocean basins (i.e. Atlantic, Indian, Arctic, and Pacific Oceans; www.eGEOTRACES.org; ( Schlitzer et al. 2018 ). Soon, information that is more detailed will be provided in the CCZ region by an on-going GEOTRACES Pacific Meridional Transect cruise. Further measurements are needed from the seafloor upwards to the potential vertical extent of both benthic disturbance and midwater dewatering sediment plumes, including assessment of the concentrations of bioactive metals and nutrients, and redox regimes (which influence metal mobility). In addition to dissolved parameters, natural levels of particle flux and suspended particle concentrations are important environmental characteristics. Some data already exist for particular locations, depths and times in the CCZ that may provide good background information. For instance a recent review of global suspended particle concentrations determined that the CCZ bathypelagic and benthic boundary layer have among the lowest measured particle concentrations in the world ocean ( Gardner et al. 2018 ). Particulate organic carbon (POC) flux in the CCZ region varies greatly, being lower in northern central-gyre-influenced waters and higher in the south near equatorial upwelling ( Lutz et al. 2007, Wedding et al. 2013 ). POC flux also increases from the west to east in the CCZ. To gain more data, sediment traps should be deployed at several depths, particularly at the base of the euphotic zone (which is typically measured in many past studies) and also below the level where sediment plumes are expected so that alterations to natural flux can be ascertained. Unlike physical parameters, chemical parameters such as suspended and sinking particle concentrations and oxygen are likely to be variable across the CCZ and not generalizable over large (several hundred km) spatial scales, as suggested by satellite oceanographic data products and sporadic measurements of some of these variables (see data sources in Watling et al. 2013, Wedding et al. 2013 ). The baseline acoustic regime is another important ecological characteristic. Mining activities will create noise from the ship to the seafloor, including from pumps, hydraulic lifting and rattling of nodules in riser pipes and from mining vehicles at the seafloor. Little is known about background noise volumes, sources and frequencies in remote abyssal areas such as the CCZ. However, we do know that a number of pelagic animals such as marine mammals, which are sensitive to noise, migrate through this region at least seasonally. It was noted that no acoustic measurements are required in the ISA EIS template. The light environment was discussed briefly. Light levels control the depth of vertical migration and mediate many predator-prey interactions throughout the top 1000 m of the pelagic. Sunlight visible to animals is generally absent below 1000 m. However, light penetration in the mesopelagic varies regionally, depending on primary productivity and water clarity. Thus, it was concluded that light profiles in the area should be determined. Furthermore, bioluminescent light is present throughout the water column and could be measured with systems such as the “splat cam.” Bioluminescence is correlated with organismal biomass ( Martini and Haddock 2017 ) and is thus a physical measurement that elucidates an important biological characteristic. After considering pelagic environmental characteristics within the abyssal CCZ, the group considered how similar these pelagic characteristics would be to those near seamounts and vents, the other two main habitats that have mineral resources. The conclusion was that there is minimal similarity. The abyssal plains are much deeper (to 5500 m vs depths of 1000-3000 m for vents and seamounts), with slower and less variable currents. Furthermore, the seafloor on the plains is largely covered by fine clay sediments whereas many areas on seamounts and in vent regions have hard substrates (though not exclusively) which is likely to influence the nature of the sediment plumes in habitat type. Thus, it will be important to assess environmental characteristics in a habitat-type framework. The group also discussed the preferred discharge depth for dewatering plumes because this key variable will determine where particular knowledge of pelagic ecosystem characteristics will be needed. Two positions were explored and considered. One option would be to discharge dewatered sediments a few hundred meters above the abyssal seafloor. Because the density of organisms decreases with depth until reaching the benthic boundary layer, one thought was that it is better to discharge plumes as deep as possible but still a few hundred meters above the bottom to reduce smothering the benthos and suspended particle loads in the BBL. Keeping the plumes above the BBL might reduce impacts to benthic and demersal communities, which have relatively high biomass and biodiversity. The persistent component of the plume would then be focused as deep as possible where biomass/diversity is low before it increases again in the BBL, a very rich layer of the pelagic. The second option considered was to discharge the dewatering plume as close to the seafloor as possible where the benthic ecosystem would already be greatly affected by the benthic plume and direct disturbance generated by the collector itself; a dewatering plume discharged close to the seafloor would blanket already smothered communities, thus “minimizing” impact. In comparison to discharge much higher in the water column, discharge close to the bottom, would likely minimize the horizontal spread of the dewatering plume. This second option was ultimately favored. Some doubt was expressed about whether contractors would bring the discharge pipe all the way back to the seafloor due to cost, but it was thought that this was technologically possible. A final comment was that we cannot confidently speculate on the best depth for plume release until we have a better understanding of the physical and chemical properties of the baseline ecosystem and of the plumes (including thermal characteristics, density, and buoyancy). For environmental characteristics, the workshop participants decided to combine the vent and seamount habitats into a single discussion group due to some similarities in habitat depths, elevated bathymetries (vent deposits often occur on ridge systems or on raised topography and seamounts in arc/back arc systems), and complex and sometimes enhanced flow environments. This group began its discussion by first evaluating “What is the mining technology like and how does this affect the seamounts and vents of interest?” The goal was to provide context to the discussion and help narrow our understanding of what information is needed. Mining on seamounts was considered challenging due to the extremely rough terrain but still possible. Contractors are mostly considering mining seamount flanks where the topography is a bit more regular or on seamounts that are flat-topped (guyots). There will clearly be limits to the conditions under which mining machines can operate. It was not clear what those conditions may be, how many seamounts will be mineable, or how many of these are in the prime crust zone. General depths considered for seamount crust extraction are 800-2000 m. Currently there are 3 exploration claims in the NW Pacific and another in the SW Atlantic. Next, the group evaluated the potential physical impacts of mining. Mining will convert hard substratum into a soft substratum of ground up material – rubble rather than clean rock surfaces. Contractors have different machines for different types of bathymetry or bottom type. Machines operating on seamounts are likely going to grind off the top ~5-50 cm of the cobalt crusts. In contrast, for massive sulphide deposits at vents, mining will create pits many meters deep targeting layered deposits that are often subsurface. Also, in some cases the substrates are a mosaic of hard seafloor, crushed rubble or even a top layer (overburden) of sediment that may generate a significant plume during removal. In both cases however, there is some assumption that the mining technology used will be similar, as grinding of hard substrates is required. Depth is an important environmental characteristic of these habitats as it covaries with many other environmental variables (pressure, light levels, temperature etc). Pelagic communities are very depth-stratified. Thus seamounts or mid ocean ridges with depths near or above the daytime depth of sound scattering layers will affect these biotic vertical migrations and may enhance delivery of food to pelagic and demersal predators. Further, shallow features may alter flow such that nutrients are injected into the euphotic zone enhancing local primary production. This is unlikely to be the case for seamounts currently targeted for mining because they are deeper, but injection could occur if mining targets the deep flanks of shallower features. Similarly, ISA contracts for SMS deposits are mostly below 2000 m depth. It was unanimously agreed that site-specific bathymetry is a key environmental characteristic of seamounts and vents. These habitats are highly complex and heterogeneous. Fortunately, bathymetry will likely be known in claim areas, often from detailed AUV surveys, due to its importance in mining activities. Bathymetry partly determines whether seamounts have an effect on local primary production, the flux of particulate organics to bottom feeders, the impingement of pelagic fauna on the seafloor and hence top predator aggregations, and the flow environments, which will be important for larval connectivity and plume dispersal. Due to complex interactions, it is difficult to predict the flow field from bathymetry alone, however. Clearly related to complex and elevated bathymetry (and also the background flow field) is enhanced current flow, mixing and turbulence. These enhanced physical processes will occur on deep to shallow features to varying degrees. Flow and turbulence enhancements around seamounts, ridges and axial valley bathymetry will increase the dispersal and mixing of mining induced sediment plumes in the benthic boundary layer and in the water column above. Vent and seamount habitats are extremely complex bathymetrically so site-specific characterization of the flow field will be very important. In general, nearly symmetrical seamounts will have more flow enhancement around flanks and trapped circulation features at their summits. It was noted that seamounts rarely have Taylor columns, rotating columnar circulation features above the seamount peak, but there are some Taylor caps (conical circulation features ( Goldner and Chapman 1997, Kunze and Toole 1997 ) that persist for long enough periods of time to enhance primary production, if they are shallow enough, or temporarily retain some pelagic animals in deeper waters ( Rowden et al. 2010 ). However, the levels of endemism in seamount communities do not suggest very long durations of physical retention on seamounts/ridges, as was hypothesized many decades ago ( Rowden et al. 2010 ). Elongate ridges or seamounts will have flow enhanced over their summits and these features will generate internal waves. On large mid ocean ridge features, abyssal currents are trapped on the flanks, resulting in complex dynamics both along and over the crest as topographic flow rectification ( Lavelle 2012 ). Within axial valleys flow can proceed along the axis near bottom ( Garcia Berdeal et al. 2006 ) which may act to retain plumes. In addition, habitats with elevated bathymetry will alter flow downstream of the mean background flow analogous to island wakes, which will act to modify dispersal of plumes from seamount mining. Despite our general knowledge of flow in these habitats, due to their great diversity and site-specific heterogeneity, everyone agreed that site-specific characterization of the flow field would be required for each mining claim. There are existing HYCOM or ROMS models with resolution to 2000 m depth available, which would be good as an initial starting point but would not obviate the need for empirical measurements. Regional flow and stratification are also environmental characteristics that affect the site-specific flow fields. Water column stratification is important because it influences flow effects and mixing and it varies latitudinally and seasonally. The background flow field in these habitats is variable from gyre circulation to equatorial jets and from the east to west of basins, which influences the velocity of general circulation. Background flow provides the initial conditions from which to understand local flow around the seamount or ridge. Further, background flows can be seasonal as has been shown at vent sites on the Mid-Atlantic Ridge. A key environmental characteristic of hydrothermal vent systems is the presence of natural particulate plumes. They have been characterized in some regions and generally extend to ~200 m vertically and have high concentrations of metals, organics, reduced compounds and microbes (e.g. Cowen et al. 2001 ). Some natural plumes have been characterized and the influence of natural plumes on water chemistry is a regional phenomenon (e.g. regionally higher metal concentrations; e.g. Geotraces). However, more localized, feature-specific data are often lacking. It was noted that these plumes occur at active venting sites but we expect that sites with vigorous venting will not be targeted for mining. No such natural plumes exist at inactive vent sites, which can be between zero and 100’s km away from active sites and their associated plumes. However, even if natural plumes are some distance away from mining activities this background natural activity will make it difficult to separate the water column effects of natural and mining activities. Nonetheless, the behavior of natural plumes intersecting with the regional flowfield can provide insight into dynamics of mining-generated plumes. It was noted that some seamounts can have sediment plumes naturally from “storms” or enhanced turbulence events over their flanks and summits, but the extent of such plumes was thought to be small and transient. Overlying primary production is important as it affects food supply to deep-sea ecosystems – both benthic and pelagic. Seamount-specific local alterations can occur and they are currently being documented. Enhancements of primary production can stimulate increased fisheries production. Local primary production will also be affected by general latitudinal and basin scale variation that can be characterized with satellites. Furthermore, productivity in vent or seamount habitats may have clear seasonality or a lack of it based on regional scale dynamics (e.g. above 36º N the Mid-Atlantic Ridge exhibits clear seasonality in production). Suspended sediment concentrations and organic particle fluxes are key variables in the context of mining because mining induced plumes could greatly alter these environmental characteristics. Natural levels are related to productivity providing some ability to predict values though there are few direct measurements on seamounts. Particle concentrations and vertical flux are higher in axial valleys than over seamounts due to venting at the former. Organic particle concentrations in vent plumes derive both from the benthos and from carbon fixation in the plume itself ( Bennett et al. 2011 ), thus vent plumes have marked input of carbon into the deep-sea ecosystem ( Levin et al. 2016 ). A recent review of global particle concentrations does not include much data on mid-ocean ridges or seamounts ( Gardner et al. 2018 ). More study into these environmental characteristics is needed. A number of water chemistry parameters were discussed because mining induced sediment plumes could alter oxygen and metal concentrations among other variables. The regional and depth distribution of parameters such as oxygen concentration and pH have been investigated. They vary by basin location and age of water mass. Regional maps can be found in the literature (e.g. Levin 2002, Sabine et al. 2004 ). Global programs such as GEOTRACES also provide regional-scale context for trace metals and suspended particles but their resolution is low and not capable of resolving seamount or vent habitats in detail. At the local scale, vent plumes clearly increase metal concentration, reduce pH, alter redox chemistry and reduce oxygen concentrations as mentioned above. Indeed vent plumes are detectable somewhat beyond local scales in broad sampling programs such as CLIVAR (but this doesn’t measure metals) and GEOTRACES. The local chemistry above crust rich seamounts and potential alterations is not known but the expectation was that there would be little contrast to the background water chemistry of the region. 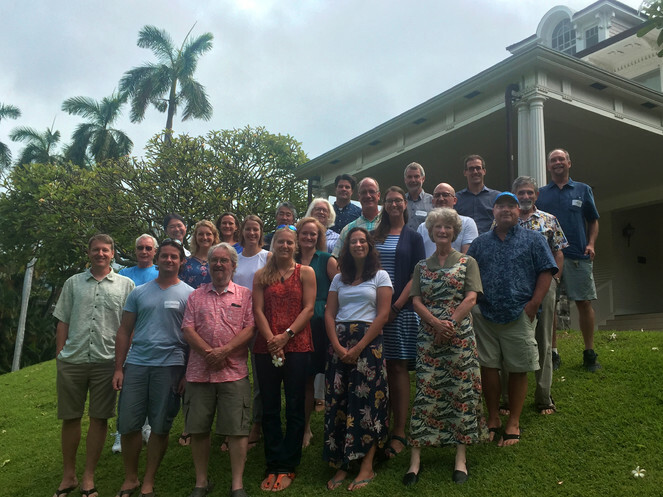 The group discussed how climate change will affect many of the above environmental characteristics, including ocean acidification, deoxygenation, changes to large scale primary productivity patterns, circulation and water column stratification. Thus, these long-term changes must be taken into account as multiple stressors given the long duration of many proposed deep-sea mining activities. The group evaluated the scales at which environmental characteristics in the pelagic should be known. In the context of mining, it is the mesoscale (10’s of meters in the vertical, 100’s of meters to kilometers in the horizontal) that is the smallest scale that matters because sediment plume effects will be larger than this. For the temporal, the scale that matters is years as mining will be ongoing at a site for ~10-30 years. For the purposes of monitoring and observing the scale of anthropogenic changes to the environment sampling would have to occur at these spatial and temporal scales, possibly finer scales and frequencies (and ongoing), to capture changes to environmental features. Correlated to many of the environmental characteristics above is the geographic location of any vent or seamount feature. Thus, the location of a feature could be used to predict general features of a mining area. For instance, latitude affects food web interactions via seasonality of primary production, which results in variation of the vertical detrital flux (as seen on the mid Atlantic ridge). Latitude also affects the physical environment such as proximity to equatorial jets. Furthermore, the Atlantic, Indian and Pacific Oceans are very different from one another in terms of vertical profiles of temperature, oxygen, surface primary productivity, and surface or deep storm activity: all characteristics that could affect sediment plume dispersal or settling. These differences stem in part from global deep-water mass circulation and age as well as meteorological patterns. Biogeography of organisms was also discussed briefly in this context because different regions have different faunas. Each regions fauna could respond differently to impacts due to their evolutionary history and environmental differences (see answers to question 2 below) which lead to differences in community composition and the relative importance of taxa that might be more susceptible to mining effects. In the context of geographical locations of seamounts, it was pointed out that what we know about them largely comes from studies in the Atlantic and NE Pacific. We know very little about seamounts in the prime crust zone in central West Pacific. In the context of this discussion, the depth of discharge of dewatering plumes was evaluated. Given the strong and heterogeneous flow environments of seamounts and vents it was suggested that the plume should be dispersed below the level of most turbulence to minimize dispersal and localize effects to the pelagic. Further, most agreed that the discharge plume should be as deep as possible – below the mesopelagic and below strong turbulence and mixing regions. Some thought that the BBL layer was preferred in terms of targeting plume return because this layer would already be the most disturbed part of the water column from benthic mining activities. Seamounts and ridges/vents have many similarities in terms of environmental characteristics but do differ mostly due to the presence of natural sediment and chemical plumes at vents. This means that vents in axial valleys have higher suspended particle concentrations compared to seamounts. This affects biological communities with axial valley organisms likely more adapted to suspended sediment loads. It should be noted however, that much of the suspended particles in natural plumes include organic materials, whereas mining plumes will be dominated by the inorganic fraction. Also, as a consequence of their natural plumes, vent and ridge systems have higher background metal concentrations compared to seamounts, which again may translate to sensitivities to some extent. However, it was noted that the MIDAS program performed toxicity studies on vent organisms and found that while they may have had lower sensitivities they were just as sensitive to changes in concentrations as other organisms ( Hauton et al. 2017 ). In the context of this discussion, the group strongly felt that not all seamounts, ridges and associated vents were the same. For these features generalizations of environmental parameters was very difficult. However, these features had much more in common with one another than they did with abyssal plain habitats. The largest differences were the high variability of setting, including depth (800-4000 m vs 4000-5500 m on the plains), and the flow environment (very slow with low turbulence on the plains). Further, the mining induced sediment plumes generated at vents and seamounts will be different compared to those from nodule mining because the ore will be crushed, creating more angular and sharp fines compared to material harvested from nodule fields. How similar are these characteristics between the 3 main mining ecosystems – abyssal plains, seamounts/ridges, and vent regions. To begin the discussion, the group first identified abyssal habitats for which the midwater ecology/biology was well defined. There has been substantial study of the oxygen minimum zone (OMZ) principally to depths of ~1000 m in the Eastern Pacific and off Baja California. The OMZ is strongest and shallowest in the eastern Pacific and to the north of the Equator (the southern CCZ) diminishing in intensity moving west and north and increasing in intensity over the last several decades ( Stramma et al. 2008 ). Studies show reduced diversity and biomass in the lowest oxygen zones and also alterations to vertical distributions within biotic species, higher taxa and functional groups ( Maas et al. 2014, Wishner et al. 2013 ). They have also documented a fauna that is specific to the OMZ-dominated eastern central Pacific region. These results are useful and partially generalizable for the eastern CCZ and possibly to other low-oxygen regions of the CCZ. There is also some research on the benthic boundary layer off California at Station M, a multi-decadal time series study site which largely has focused on benthic communities. In addition, long time-series data are available from the HOT program at Station ALOHA north of Hawaii; the HOT program has focused on the epipelagic ( Valencia et al. 2016 ), but some mesopelagic studies likely relevant to the northwestern CCZ have been conducted in the same location ( Gloeckler et al. 2018, Hannides et al. 2013, Sommer et al. 2017, Steinberg et al. 2008 ). Pelagic research has also been conducted along the equator to characterize epipelagic, and to a lesser extent, mesopelagic zooplankton and micronekton biogeographies, fisheries resources, and ecology ( Barnett 1984, Clarke 1987, McGowan 1974 ). In addition to region specific information, it is also well known that on a global scale, food availability (satellite-derived surface water productivity as a broad proxy) controls pelagic community biodiversity, biomass and abundance. Though we thus have some knowledge of epi and mesopelagic community structure and biogeography within the eastern North Pacific, it was agreed that that the CCZ mesopelagic to bathypelagic remain virtually unstudied and we can extrapolate only very general relationships from other regions. Detailed mesopelagic and bathypelagic studies are needed. The group then evaluated which ecological/biological characteristics are pertinent to understanding the impacts of deep-sea mining. For each depth zone of the pelagic (epipelagic, mesopelagic, OMZ, bathypelagic, abyssopelagic to BBL, especially bathypelagic to BBL) the following were characteristics considered important. Basic characteristics to be assessed included depth-stratified biomass, abundance, community structure, diversity (species or operational taxonomic units and functional diversity) and the diel cycle of these parameters as a consequence of animal vertical migration. These data could be acquired with depth-stratified net samples for hard-bodied animals such as fishes and crustaceans, and ROV/AUV visual transects targeting gelatinous zooplankton and fragile taxa. Such approaches require standardized imaging techniques. Net tows in the BBL are logistically challenging so study could also include plankton pumps and baited free-vehicle camera deployments for some taxa. Acoustic surveys could also contribute substantially to biomass/abundance estimates and vertical migration dynamics over large regions, but this approach lacks taxonomic resolution. The physical taxa collected by nets and other approaches would need to be identified morphologically and genetically for all size classes (e.g. barcoding). It was also emphasized that samples and data should be archived in a centralized collection, including physical specimens, images/video, and genetic data. Ecosystem function variables also are needed but generally lacking. For instance, food web structure and function is typically known only for commercially important species and their predators and prey. However, food webs vertically connect pelagic strata and thus could translocate the impacts of deep-sea mining plumes. Thus, studies of food webs are warranted and could utilize physical specimens for stable-isotope and gut-content analyses. For instance, isotopic analysis of particles and animals in the deep mesopelagic and bathypelagic has shown that food webs there may be adapted to take up very small particles ( Choy et al. 2015, Gloeckler et al. 2018, Hannides et al. 2013 ). The group also identified the depths where ecological/biological characteristics should be characterized in relation to deep-sea mining. It was agreed that for baseline studies, full depth, high-resolution studies of microbes, primary producers, zooplankton, gelatinous zooplankton, and nekton communities from the sea surface to the seafloor are needed. This baseline information could then be used to identify the preferred depth of plume deposition based on the vertical profiles of ecological characteristics. At the regional scale, it was recognized that pelagic communities are relatively broadly distributed and more homogenous than at the seafloor, with similar assemblages across 100’s of kilometers in the horizontal. Thus, the group suggested that baseline characterization of pelagic communities at 3-4 target reference regions (with multiple replicate sites within each) across the CCZ region, capturing the mesopelagic biogeographic provinces of Sutton et al. (2017) , might be sufficient. These sites could include the eastern Pacific, equatorial upwelling, central gyre and western gyre. Sampling might be best placed in the APEIs to allow monitoring of a regional baseline after mining begins. Such an approach would need to be ISA-mandated, perhaps through a fund paid by contractors and administered by the ISA. This approach would save each contractor time and money by pooling their resources, and would provide several regional baselines. For monitoring of mining activities, additional sampling (as suggested above) would be needed in each claim area for comparison to the baseline sites. As for question 1, discussion of vents and seamount habitats was combined into one group. The group outlined which ecological/biological characteristics are pertinent to understand in the context of mining effects on pelagic processes. Biodiversity was considered important, but due to concerns about the absence of species-level data in many cases (due to varying taxonomic expertise, cryptic species and undescribed species) functional diversity was suggested as a very important alternative. Microbial diversity was also discussed but again more from the perspective of functional diversity to evaluate variations in microbial loop and food web interactions. Community composition and biomass in the pelagic are also important to consider. Both are generally uniform over large spatial scales but can differ over seamounts and vents/ridges. For the latter, the influence of vent plumes can extend into the overlying water column by 200 m or more. It was noted that there was a need to consider deep-scattering layers (biomass and vertical migration) not only in the mesopelagic but to depths of 2000 m or more based on some studies which show migration to such great depths ( Cook et al. 2013, Marsh et al. 2018 ). In terms of functional characteristics, food webs were identified as very important to understand. In particular, filter feeders (e.g. appendicularians, salps, pteropods) are important components of pelagic food webs. They may increase sediment packaging and downward transport, and may be particularly sensitive to sediment plumes. There was some discussion about how microbes might be important to the mesopelagic in terms of mining especially in response to release of reduced compounds. It was not clear how (or for how long) microbial assemblages might change in response to mining plumes. The microbial community can be quite resilient and due to its phylogenetic diversity and physiological versatility will likely respond quickly to environmental change and also recover quickly. However, it was considered important to understand what microbially mediated processes are occurring that may be important indicators of mining impacts. Connectivity was also considered very pertinent to understand as both seamounts and vents are “island” habitats that rely on successful dispersal and recruitment. Larval transport will be different for seamounts compared to ridges due to more constrained flow on the latter. For seamounts, proximity to continental margins is important for larval supply while vent systems are more like island archipelagos in which distance between sites and size of sites is likely very important ( Baker et al. 2016 ). Vertical connectivity is very important for many species whose eggs are buoyant and whose larvae travel vertically, often from the surface to the adult depth. This is a common strategy for many midwater fishes and crustaceans. Many benthic species also utilize the water column for larval dispersal and population connectivity. For instance, some vent shrimp and mussel larvae rise to the surface whereas others remain in the axial valley, and others have crawl away benthic larva. The group evaluated what could be extrapolated based on studies from elsewhere. For this purpose, biogeographic provinces for the mesopelagic may be the best available information ( Sutton et al. 2017 ; Fig. 4 ). They are general but provide a context for understanding biodiversity and community structure. They are based on environmental characteristics (temperature, oxygen concentration, salinity, etc) then adjusted where biological community patterns are known. For instance, primary production is very important and at broad scales relates to the mesopelagic fauna ( Proud et al. 2017 ). Both the level of primary production and its seasonality is important to predict biomass and faunal composition, as noted in answer to question 1 above. With regards to seasonality, the timing of mining activities may be important due to seasonal spawning or migrations. Overall, the group decided that regional environmental management needs to take known mesopelagic biogeographies into account. All agreed that we know little about the bathypelagic, quantitatively at least, but proceeding from the general assumption that vertical zones of the ocean are linked, using mesopelagic provinces was a starting point. The mesopelagic ecoregions or biogeographic provinces of the world’s oceans proposed by Sutton et al. (2017) , available under a CC BY 4.0 license. The numbers are simply for reference, and relate to the geographical names referenced in the paper and in the workshop discussion below. Areas with depths less than 200 m shaded in black. The group then discussed the pelagic communities of seamounts in more detail. Some seamounts are known to have endemic pelagic species not found in the neighboring open ocean ( Boehlert and Mundy 1993, Wilson and Boehlert 2004 ). Additionally, there is a clear “seamount effect” for upper food web predators such as tunas that have enhanced abundances and biomass over some seamounts. These mobile species are visitors to the seamount. For instance bigeye tunas have high residence times over shallow seamounts and fuller stomachs there ( Holland and Grubbs 2007 ). The mechanisms facilitating this enhanced feeding is unclear but shallow low latitude seamounts can have planktonic production peaks stimulating bottom up effects. Additionally, shallow topography may trap plankton and micronekton advected over it during the night when the animals try to migrate back to depth in the morning. Finally, flow or upwelling over and around seamounts may concentrate the background prey field. Studies have also demonstrated that due to local faunas and visitors seamount mesopelagic and epipelagic communities have enhanced biodiversity. Also some commercially important mesopelagic species such as black scabbardfish and pelagic armorheads use seamounts as sites for reproductive aggregation. Though much of what is known about seamounts is from the mesopelagic, studies have found concentrations of biomass at 2000 m off Tasmania and near the Azores at 2500 m using acoustics ( Sutton et al. 2008 ). Therefore, the midwater influences of seamounts and future studies need to extend to these bathypelagic depths. Ridges associated with vent systems were discussed as well. These have been fairly well studied in the north Atlantic as part of the MARECO and EcoMar projects focused on the Mid-Atlantic Ridge (MAR). Ridge habitats have an enhanced pelagic fauna in terms of biomass and diversity, which may be due to a resident community. It was also noted that diel vertical migration was occurring to at least 2500 m along the MAR. Ridges may also harbor a large fraction of the large reproductive individuals in some populations, at least for fishes ( Sutton et al. 2008 ). Further ridge structures are very large and the MAR has a channeling effect associated with topographic fracture zones. Seamounts differ in this regard due to their smaller size. Within axial valleys and in the benthic boundary layer highly elevated zooplankton levels have been recorded up to 50 m above bottom ( Skebo et al. 2006 ). Studies have shown that the vent plumes attract or enhance the abundance of some animals such as shrimp and copepods. For instance, along the East Pacific Rise plumes enhanced zooplankton biomass including copepods that feed in the vent plume. In contrast, fishes avoided it. Plume-influenced pelagic communities have high diversity and high endemism suggesting that at least some species are adapted to these conditions. The sphere of influence of vent plumes needs to be considered in more detail but may be relatively small (100’s m) in terms of immediate chemical alterations but large in terms of organic inputs and longer term elemental cycling in the oceans ( Levin et al. 2016 ). It appears that natural plume effects on the pelagic are a mixture of vent plume induced changes from the seafloor-up and normal migrations of fauna from above it. The mesopelagic provinces where existing seamount exploration claims occur were evaluated specifically. Seamount exploration contracts are now concentrated in the northwestern Pacific lying within the North Pacific Gyre biogeographic province (#4 in Fig. 4 ). This province is bounded by the North Equatorial and Kuroshio Currents. It is oligotrophic and has a fauna distinct from that of central Equatorial Pacific. The exploration area in the south Atlantic Rio Grande seamount area is located in province #27. This is the tropical and west Equatorial Atlantic province dominated by easterly winds that cause divergence and upwelling. The region is generally oligotrophic except for regions of upwelling and it is noted for a distinct cephalopod fauna. The state of biological/ecological knowledge of pelagic communities below the mesopelagic was discussed as a major knowledge gap. Both faunal inventories and biomass levels are very poorly known. Based on general depth-related declines in biomass and diversity, we assume lower levels of these variables compared to the mesopelagic. Despite the poor characterization of this zone, it is likely to be influenced by the discharge of dewatering plumes and much more data is needed. The group discussed additional knowledge needs. It was agreed that depth-stratified biomass from the mesopelagic to the seafloor categorized by functional diversity at least, was the most important need. Where OMZs are present it would be critical to sample in relation to oxygen concentrations. Sampling above the benthos in the BBL would also be important in relation to benthic collector plumes. Active acoustics could define layers of enhanced biomass and net tows could then determine each layers taxonomic and functional composition. Standardization across studies is important and samples could be archived in publicly available locations from which key species to focus on could be determined. Finally, it was agreed that for any mining area a time series of these parameters would be needed starting before mining and continued afterwards to monitor impacts. The biological/ecological characteristics were then compared between the three main mining ecosystems – abyssal plains, seamounts, and vent regions. All three were considered to be quite different biologically. There is often high biomass and abundance in the pelagic over ridges and vents (e.g. the east Pacific Rise, MAR). This may be true to some extent over seamounts but likely due to different mechanisms such as physical compaction/compression/concentration of pelagic community and or spawning aggregations. There is higher diversity at seamounts and ridge/vent systems compared to neighboring waters but the mechanisms causing this vary. At seamounts, diversity is typically high due to visitors such as pelagic fishes, mammals, and turtles, rather than endemism at vent/ridge systems. Connectivity patterns are also likely different between habitats which should be considered. For instance, axial valley transport plays a role in ridge/vent systems but not elsewhere. These connectivity patterns are most likely different between benthic species using the pelagic for larval dispersal and for habitat specific pelagic endemics. In contrast to both, the mesopelagic fauna is generally widespread. It was also pointed out that seamount systems are very different from one another, requiring more investigation into the drivers of variation in seamount pelagic communities. What are the key differences and similarities between benthic plumes generated from seafloor activities and dispersal of the dewatering fluids at varying depths? How are plume characteristics (e.g. particle sizes, eddy diffusivity, advection distances) likely to vary between the mining regions? How do varying plume characteristics affect plume dispersal and persistence in the pelagic zone over the different mining regions? What intensity and extent of plumes might be created unintentionally from leakage from pipes/ships, from failures (e.g. pipe ruptures) or natural disasters (hurricanes)? To tackle this question a single breakout group was created, in parallel to the groups for questions 1 and 2. This was led by Tom Peacock and Paul Hill. The question/topic was central to the workshop but difficult to address because much of the mining technology is under development and/or proprietary. Therefore, a more general approach was taken. The group first evaluated regulatory goals with the aim that mining technology could be engineered to meet the dual concerns of acceptable impact and acceptable regulation, keeping in mind that the legal requirement is to ensure effective protection of the marine environment. Goals might include that suspended particulate mass (SPM) or concentration must be no higher than a specified fraction of the background within a specified distance from the operations. The benthic equivalent already articulated elsewhere would be that the seafloor depositional layer must be no larger than a specified depositional rate (mm/y) within a specified distance from the operations. However, how do we set the thresholds (specified fraction of background)? Variables to evaluate for thresholds would include light, chemical toxicity, smothering, and diet quality (dilution from suspended particulates). These depend on SPM, but dissolved plumes are of concern as well, particularly with regards to metal toxicity. Determining the appropriate thresholds is incredibly challenging, as no data exist for pelagic species due to the difficulty in keeping them alive under controlled conditions. Threshold values are not likely be extrapolated from work on benthic species, which indicate high sensitivity in those animals, because studies of metal toxicity show incredibly complicated species specific effects that are both temperature and pressure dependent ( Brown et al. 2017, Hauton et al. 2017 ). These findings further indicate that the use of shallow water analogs will not yield meaningful results. Instead, there was some discussion about using an objective standard based on observed natural variability of these conditions (specified fraction of background variability). Several factors will be determinants of SPM in a passive plume. A mining vehicle or discharge pipe will create a dynamic near-field plume that sets the initial concentration, size distribution (which includes aggregation) and settling velocity. This will then be affected by advection and diffusion, which may be site-specific. The technology employed will also be an important determinant. Characterization of the plume will require detailed engineering/design/modelling for each type of operation. The near seabed plumes will differ between the three main resource types. To begin with, the sources of the plumes will differ based on technology. For massive sulphides or seamount crusts, there will be multiple sources due to separate vehicles for first grinding material and then others actually collecting it for return to the surface. In the case of nodules, a single moving collector will also be the point of material lift to the surface ship. The material creating the plumes in the case of sulphides or crusts will be engineered – effectively crushed minerals – whereas in nodule provinces most of the plume will be natural fine sediments, but in extremely large volumes as the collector moves over hundreds of km2 each year for a single mining area. The region affected by the seabed plumes may also differ geographically in that sulphide and crust mining activities are relatively localized (though in high energy environments that may aid in plume dispersal) whereas nodule activities will be very widespread (300-600 km2 per year per claim ( Oebius et al. 2001 ). Water column plumes will also differ between the resource types. Massive sulphide deposits often include a sediment overburden so there will be a medium load of fines present in the plumes. Crusts are typically mined from hard substrate and thus will have larger grain sizes. Nodules mined from the abyssal plains will generate water column plumes with a very high load of fines. Primary productivity in the overlying water column affects natural loads of particles and organic material content, which in turn has a bearing on flocculation processes of sediments. As discussed above, productivity over ridges and vents is dependent upon regional conditions, can be elevated locally at shallower and low latitude seamounts and is certainly lowest in the CCZ where nodule mining is concentrated. Finally, water column plumes will be effected by interaction of the flow environment with local bathymetry, which will occur for both massive sulphides and seamount crusts but is unlikely in abyssal nodule settings (see flow discussion in Q1 above). The dispersal and persistence of both plume types was also discussed and differed by resource type. Due to the flow characteristics of ridges and seamounts plumes generated from sulphide and crust mining would have rapid and variable dispersal and thus lower but variable persistence. Dispersal of plumes from nodule mining, particularly plumes near the seabed would be slower to disperse and have a much higher persistence due to the high load of fines and slow bathypelagic current speeds. Finally, there was some discussion of unintentional events such as catastrophic equipment failure or large natural hazards (e.g. hurricanes). However, it was concluded that the potential for major environmental damage from an event is low because the sediment source would shut down quickly. In contrast to the oil and gas industry, the failure mode in mining is most likely cessation of sediment discharge rather than runaway spillage. That said, the short ‐ term threat in these type of situations is probably greatest in the surface ocean where there is probably no prior sediment discharge. How will these effects vary with plume particle size, concentration and/or extent, which then can be used to evaluate the temporal and spatial extents of perturbations? How will effects on organisms alter ecosystem function? E.g. vertical transport of carbon, food webs, oxygen demand? To help frame this question there was some discussion prior to breakout of the three habitat groups. It was remarked that the FAO criteria for determining serious harm with regard to deep-sea fisheries was relevant to consider here. In addition, with regard to plumes there is a literature from lakes, estuaries, tailings disposal, storm runoff on corals, and river effluents into the ocean, that needs to be reviewed from a mining impact point of view. Further it was articulated that the ideal goal was to use the precautionary principle rather than adaptive management approaches that could result in initial (and substantial) harm prior to the implementation of appropriate measures. However, see the point below in the next paragraph. General discussion then evaluated the thresholds or level of environmental perturbation that would be deemed acceptable. Natural background values for suspended sediments exist in some environments, solar light is known to be undetectable below 1000 meters, but background noise levels and metal concentrations are often unknown (at least for some metals). Background values should be determined as part of contractor baseline studies. The group generally favored limiting plume particle concentrations, noise and light levels to 2-3 times the natural range. This was proposed because the sensitivities of most deep-sea animals, including pelagic species, is unknown and very difficult to determine. Alternatively, it was also articulated that an incremental approach to understanding how mining will affect the midwater fauna may be required because of our lack of information. Some were concerned that test mining (single equipment tests, small scale vehicle tests) would not be at large enough in scale to predict the effects of full scale mining activities. Therefore, it was suggested by some that mining could start with a single pilot operation limited in scale and time that was monitored very closely in conjunction with a team of scientists to comprehensively monitor all variables of interest in and around the operation. This would enable a view of the sensitivities of the pelagic fauna to plumes and other mining effects and the ecological consequences of a mining operation on the pelagic from which management could then be modified to ensure the protection of the marine environment. However, there was debate on whether adaptive management was possible or suitable because it still required some understanding of targets and methods to determine thresholds, the ability to pause, reassess, and possibly stop activities, if necessary. The group considered impacts of mining on different taxonomic and functional groups. Microbes were thought likely to exhibit changes in community composition due to the additional surfaces in the water column (from particles) and due to alteration of water chemistry from plume solutes. Suspension feeders are likely to have degraded diets (gelatinous and crustacean suspension feeders) from an abundance of inorganic particles. This will incur increased metabolic costs for processing which could lead to a variety of sublethal effects. Gelatinous taxa would also experience suffocation due to clogging of respiratory surfaces by particles. Fishes and marine mammals would experience altered prey distribution fields, and fish could experience respiratory distress due to particles interfering with their gills and reduced oxygen content in plumes. All of these taxa, with the exception of microbes and non-visual invertebrates, would also suffer from the degraded light field in plumes. The relative probabilities, severities and scales of impacts along with mechanisms behind impacts were tabulated in the table below ( Table 1 ). The direct effects of sediment plumes on deep midwater taxa. The impacts of light and noise are not included here. Unknown. Extra surfaces for attachment and new solutes from plume. New microbial community introduced from sediments. Microbes may be scavenged. Community structure and function will be impacted but difficult to predict specifics. Interference with feeding; salps and appendicularians are mucous feeders, so this would foul their feeding structures; suffocation/ smothering likely. Altered ingestion behavior because of selective feeding and loss of energy through parsing more useless particles (related to particle size); smothering unlikely; will olfactory sensors be clogged? Food web perturbation; stickiness of tentacles may be impacted by sediment sticking to it – capture efficiency would be reduced. Food web perturbation - their prey will be redistributed; suffocation possible at high sediment concentration and in OMZs. Food web dynamics are unlikely to affect them substantially as their prey is higher in the water column. However recent evidence points to deeper feeding than previously believed ( Marsh et al. 2018 ). Range of microbes is greater than the plume and connectivity is high. Mortality may extend beyond the plume because of avoidance and migratory behavior. Escape depends on scale of plume in relation to range of organism – vertically and horizontally. May extend beyond the plume. Beyond the scale of the plume. Travel scales are large in comparison to plume. They are likely to avoid it. Very high; sensitivity is high. Certain; sensitivity is higher than microbes (lethal impacts). High, but less sensitive than for gelatinous suspension feeders. Not as high as suspension feeders. Less sensitive if they can migrate away from the plumes. Recovery will be relatively quick once plume is gone. Dependent on advection from outside plume; distributions are broad, so probability is high at time scale of flow. Generation times and reproductive rates are unknown (months-years), advection will be more important to repopulation. Very long timescale; slow growth and reproduction times. High potential recovery from migration back into region after plumes have settled. The group discussed the effects of a degraded light field on various bioluminescent modalities, which are extremely important in deep-sea ecosystems, particularly deep midwater ecosystems ( Haddock et al. 2010, Martini and Haddock 2017 ). Some taxa use bioluminescence for prey detection, others for mate location and intraspecific communication, predator confusion and for camouflage in the form of counterillumination. In short, the midwater fauna use bioluminescence to feed, hide and reproduce. All of these uses of bioluminescence are potentially affected dramatically because of a) the very low baseline particle concentrations in these ecosystems, b) small clay sized particles which will dominate the abyssal sediments result in high light attenuation and c) suspended sediments absorb blue light, the most common wavelength for bioluminescence ( Warrant and Locket 2004 ). Thus, sediment plumes from midwater discharges and seafloor collections will reduce encounter distances between organisms that using bioluminescence, resulting in reductions in mating and/or feeding success. The varying effects of particle size and concentration were also discussed. The group assumed that there are threshold effects, but the thresholds are unknown. Further they would be difficult or perhaps impossible to determine with laboratory studies because of the challenges of keeping midwater animals alive in captivity. In situ studies along concentration gradients created by test mining are a possibility to develop thresholds for acute effects in lieu of controlled laboratory study. It was also concluded that the very small particles (< 10 µm) are particularly important because suspension feeders feed in this size range and there is an increase in reliance on small particles with depth in midwater food webs ( Gloeckler et al. 2018, Hannides et al. 2013 ). Further, it is presumed that there will be particle size dependence for clogging and suffocation. Sediment concentrations resulting in lethal effects are likely to vary widely across taxa, and stress thresholds for chronic exposure (over days to months) will be much lower than for acute (short-term) exposure. Ecosystem effects were also evaluated and considered very likely but highly dependent upon the scales of environmental perturbation. Effects would likely include alterations to ecosystem function, oxygen consumption, and carbon dynamics. However, it was unclear what the scale of these impacts would be in space and time. This is dependent upon how rapidly and widespread operations are and their resulting plumes. An increase from the 100’s of meters scale to the 1000 km diameter scale elevates impacts from the mesoscale to the regional scale. To address these issues, it was concluded that simple models will be useful for first order approximations. The group also concluded that management should ensure that a persistent regional-scale haze in pelagic mid-waters is not created. Studies from other ecosystems that could provide useful data to address the effects of sediment plumes on midwater organisms were discussed. The group considered whether there may be analogous regulatory regimes and strategies from the arenas of fisheries and dredging (and others?) that might inform different ways of approaching monitoring and management. Another area of likely importance is the effect of suspended particulate matter (sizes and concentrations) on suspension feeding, including the developing microplastics literature, which may also evaluate toxicity. However, extrapolations from other ecosystems must be done with care because deep-sea particle concentrations are extremely low compared to other aquatic ecosystems and many deep-sea animals have longer generation times compared to related shallow water taxa. Indeed, specific stress thresholds from other regulatory frameworks are probably going to be too high for the CCZ, where baseline particle concentrations are very low ( Gardner et al. 2018 ) and thus the thresholds of midwater organisms are probably low too. It was also suggested that thresholds may not be the best management tool, but industry is used to this approach. The abyssal ecosystem group generated some important considerations and conclusions in the context of this workshop question. First, the oligotrophic meso/bathy/abysso-pelagic waters (e.g. over the CCZ, the most likely region for nodule mining) are the clearest on Earth ( Gardner et al. 2018 ). Its inhabitants are adapted to live in these particle-poor ecosystems and thus, the impacts of introducing particles to these ecosystems are likely to be larger than for any other ecosystems. The mesopelagic ecosystem affects carbon cycling and connects to fisheries, so plumes should be discharged below the mesopelagic. Planktonic animals travel with plumes, so they will be affected over their life cycle and across generations. Despite this fact, water column impacts are likely to be more transient than benthic impacts because the sediment clouds will eventually settle to the seafloor though this may take more than a decade ( Rolinski et al. 2001 ). The vent group first evaluated how mining effects might vary by taxonomic and trophic groups. Bacteria are known to colonize plumes, which then carry the products of chemosynthetic production. Above some hydrothermal vents higher concentrations of plankton are associated with the top of the natural plume, likely due to feeding on the enhanced microbial production. In contrast, there is also evidence that fish will avoid natural plumes, possibly due to chemical or particulate avoidance. This information helps to inform potential impacts of mining plumes, though they are not perfect analogs. In general, the ‘background’ midwater fauna was considered likely to avoid sediment and chemical plumes if they were nektonic. There is some potential for bacterial colonization of mining discharge plumes resulting in increased microbial loop activity if there is enough resuspended organic material, though most deeper sediments have low organic content. This could affect food webs, particularly suspension feeding taxa. Suspension feeders were considered particularly sensitive and important in the community response to sediment plumes. Small particles (few µm) will be the most damaging due their greater persistence and dispersal and the greatest effects will likely occur for suspension feeding species. These species will be size selective, but in the size range of the small (1-10 µm) released material which could clog filters or dilute organic particles. Furthermore, many suspension feeders are gelatinous (e.g. salps, appendicularians) with finely tuned neutral buoyancy that could be affected by consumption of heavier sediment (rather than organic) particles or settling of particles on their surfaces ( Robison 2009 ). Organismal interactions other than suspension feeding could be altered by the plumes. For instance, scavengers could be attracted if there were dead or dying animals. Also, water column turbidity will impact bioluminescent interactions, such as mate detection or luring of prey. Varying responses to the plumes across taxa and life history stages (would larvae be most susceptible as is often the case for shallow water taxa ?) would most likely lead to reduced abundance and biomass as well as sub-lethal effects. In combination, these alterations would cause a shift in pelagic community structure. Additionally, the group considered that in the long term there was strong potential for bioaccumulation and biomagnification of toxic metals through the food web to fishes. With regard to time scales of these effects, the group concluded that effects at lower trophic levels would be acute and that higher trophic levels would be affected on longer time scales and that chronic effects (10+ y) would determine the altered community state. The vent ecosystem group then evaluated the question “How will these effects vary with plume particle size, concentration and/or extent, which then can be used to evaluate the temporal and spatial extents of perturbations?” Small particles have high surface area to volume ratios, high pelagic persistence and dispersal and as a result greater potential to obstruct biological structures (filtering apparatus, gas exchange surfaces). Intermediate sized particles could be rapidly ingested promoting repackaging and flux to the sea floor. Larger particles will rapidly sink minimizing pelagic impacts but smothering benthic fauna. Discussion then centered on where the dewatering plumes should be discharged to minimize impacts. Discharge at the seafloor would reduce the spatial extent of impact in the water column as there would already be a collector plume there and it would reduce the effects of plumes in much of the pelagic environment. This would minimize damage in the mesopelagic, which provides the ecosystem services of carbon flux and provisioning of commercially important species. For vent systems, benthic dewatering plume placement could mean into the main mining pit. Discharge of the dewatering plume into the vent system’s axial valley will restrict the spatial extent of the impact but this could adversely impact connectivity of vent communities between locations because some species rely on larval connections through axial valleys. The Mid-Atlantic Ridge (and other ridges) produces more mixing over elevated topography – within ~400-500 m the valley’s ridges. Thus, discharge into turbulent waters over the ridge will keep the plume suspended for a longer interval, exacerbating horizontal dispersal and possibly interfering with dispersal of larvae within this zone. There was then debate about the pros and cons of a midwater discharge or a benthic (axial valley) discharge depth. An intermediate option would be to discharge below the depth of the mesopelagic (~1000 m) but above the depth of turbulent mixing above the axial valley or ridge. Such a deep midwater discharge was considered the least worst option. Finally, the group evaluated “How will the effects on organisms alter ecosystem function?” Following from the depth discussion, the group agreed that discharge of the dewatering plume in the axial valley would be catastrophic for the benthopelagic community – including the important larval community which mediates vent connectivity. Discharge in the mesopelagic would also be damaging for the reasons identified above. An intermediate depth of discharge could reduce alterations to major ecosystem functions. Additionally, the group suggested that lethal effects will lead to species/group removal from the food web or could lead to species replacement in diverse food webs with trophic or functional redundancy. Sub-lethal or chronic effects (including behavioral avoidance and migration) will potentially impact the rates of ecosystem functions. In addition, it is important to note that rates of discharge may determine rates of faunal removal or replacement but rates of species dispersal/advection may control the rate of and potential for recovery. Several insights were shared by comparing potential mining impacts to the FAO criteria defining significance of impact from bottom fisheries. The FAO fisheries criteria define intensity and severity but in the case of pelagic ecosystems, these criteria may require experimentation to constrain their quantitative meaning. The FAO criteria further suggest the importance of ‘the spatial extent of the impact relative to the availability of the habitat type affected’ Some of vent mineral resources are relatively small in spatial extent, so the spatial extent of the associated communities could also be considered relatively small on or near the seafloor. However, the scale of the associated ‘bathypelagic habitat’ is uncertain. If it is viewed as ‘large’ then the potential available habitat is also large potentially minimizing the issue. However, in this habitat some species are long-lived (decadal generation times for some species in the bathypelagic). Furthermore, this approach to the broad-scale effects does not consider local hotspots such as the Northern MAR, where large, reproductive individuals may aggregate for reproduction ( Sutton et al. 2008 ). So, even though the habitat may be viewed as large generally, smaller scale/localized disturbance or displacement may lead to loss of reproductive potential with long-term effects on the community. The seamount group first evaluated effects across groups (taxonomic and functional) and by major environmental change. Regarding changes in light levels, the main issue is that sediment plumes will reduce light in the mesopelagic with consequences for vertical migration (taxa seek isolumes). Noise will be generated from hydraulic pumps along the riser pipes in midwater and also from near bottom grinding of seamount crusts. This could have metabolic costs for marine mammals, turtles, sharks, and tunas that then might avoid the seamount and associated foraging opportunities. The bathypelagic is very quiet and it was thought that the animals living there would be the most sensitive to both vibration and noise in the water column. The noise perturbation might reduce predation success or predator avoidance if sensory systems were overwhelmed (‘deafening effect’). From the sediment plume itself, effects will also likely vary across taxa and functional groups. Microbes could react quickly to the new plume conditions, perhaps benefitting from increases in microbial habitat (particle surfaces) or even a food source (e.g. resuspended organics) but specific effects remain untested. Fishes and other visual predators (e.g. cephalopods, some crustaceans) were hypothesized to be strongly affected. Many have image forming eyes and are visual predators such that predation success would be reduced. Indeed myctophids, a very abundant, speciose and ecologically important mesopelagic family of fishes ( Brodeur and Yamamura 2005 ), are not naturally found in turbid waters. They may be especially sensitive in terms of gill clogging, an effect that could be species dependent. This effect could reduce respiratory efficiency, which would be a sublethal effect. In contrast to fishes, gelatinous taxa may have their filtering apparatus clogged very quickly, leading to lethal or sublethal effects, which is a major concern because these taxa are central in midwater food webs as prey for other taxa and to carbon cycling and packaging processes ( Conley et al. 2018 ). For selective filter feeders, plumes will decrease food quality by introducing large volumes of inorganic particles. Thus, these animals will have to increase effort to acquire beneficial organic particles. Overall, it was concluded that suspension feeders would be the group most affected by sediment plumes. The group also considered how these effects might vary with plume particle size, concentration and/or extent. Plumes from cobalt crust/seamount mining may not have as many very fine particles, at least for the collector plume. However, it was unclear what the particle sizes would be in the dewatering plume because engineering specifications and the nature of the ground ore were not clear. For metals and toxins, seamount mining would grind material and dissolution chemistry will be important at the seafloor and at the depth of the dewatering plume. Seamounts are sites of enhanced benthopelagic coupling ( Clark et al. 2010, Preciado et al. 2017 ) suggesting that effects could be translocated via food webs across the water column depending upon the depths of coupling. Thus the group had a strong recommendation to discharge below the bottom extent of the mesopelagic migrators (at least 1000 m) ideally right back to where the material was extracted (if below 1000 m). The bathypelagic has lower animal density and possibly diversity (to the best of our knowledge). The group also considered the potential for seamount mining to alter ecosystem function, which was mostly an effect of the sediment plume. Vertical carbon transport is an essential ecosystem service provided by the water column community. Roughly 80% of active carbon transport occurs through planktivores, in the middle of the food web, rather than larger top predators. Disruption of these active migrators could have serious implications for carbon transport and food webs. Bathypelagic food webs are arguably the most tightly coupled and are dominated by detrital feeders and species with generalist diets ( Drazen and Sutton 2017, Gloeckler et al. 2018 ). There was concern that trophic cascades were possible in this system. For instance, if the basal detritivores/ suspension feeders were eliminated the whole ecosystem could be affected. Thus, the sediment concentration (or dilution factor) at depth of the plume becomes a critical variable and reduction of particulate discharges is of great importance. Further, the hydrographic regime at the seamount controls the potential for mixing and dispersal of the plume and thus the associated scale of impact in the large bathypelagic habitat. Finally, mining sediment plumes have the potential to alter overall water column metabolism or oxygen demand, depending on chemistry, microbial response, and increased stress across diverse animal taxa. In terms of the temporal and spatial scales of the midwater effects from seamount mining, the group had several comments and concerns. Seamount mining will be patchy in time or space, not 30 years of continuous mining on one feature and thus somewhat different to nodule mining. The spatial extent could be a small halo around the seamount and not as widespread as other forms of mining. The temporal extent may be only a few years on a single seamount but it is likely that multiple seamounts in a region would be exploited over time. In was concluded that for seamount pelagic communities there was the potential for fairly rapid recovery from impacts, at least locally because epi- and mesopelagic animals would be advected into the area after mining ceased. In addition, the epipelagic would recover faster than the mesopelagic, and the mesopelagic faster than the bathypelagic, due to the relative productivities and generation times of the fauna in these zones. Relatively fast pelagic community recovery is in direct contrast to seamount benthic communities which contain centenarian species and from our knowledge of past fisheries damage will take decades to centuries to recover ( Clark et al. 2016 ). The intensity or severity of effects on groups or on ecosystem function will likely be dependent on the depth of plume discharge. Discharge in the epipelagic could cause rapid advection and mixing away from the seamount itself thus having a lower localized impact but one spread over a larger area (also affecting primary production). Mesopelagic discharge depths were considered as the worse zone from an environmental (high biomass and diversity) and ecosystem services perspective. Discharging sediments into the bathypelagic was considered to have potentially the lowest environmental impact but we still know so little about this zone that this conclusion could be driven by an absence of knowledge. Are knowledge gaps universal across all habitats or particular to each one? Are knowledge gaps due to a lack of study or do they derive from technological obstacles? An overarching knowledge gap that was identified, incorporating physical and engineering terms, was the absence of dynamic plume models. Plume models require baseline information such as background vertical particle flux ( Lutz et al. 2007 ) and suspended particle loads (particle size, shape and mass concentration; some information available in Gardner et al. 2018 ), input from general particle-tracking models, as well as data on plume discharge parameters and mining vehicle information. The latter is critical for understanding exactly where and how the plumes will be discharged. These models need to include predicted changes to optical properties, namely light attenuation and backscatter, which can inform changes to animal’s perceptional distances. With such models and realistic mining scenarios some bounds on the scale of ecosystem effects can be generated. Physical oceanographic knowledge gaps exist, some of which are high priority to fill. Many of these gaps are considered technologically feasible to complete, and therefore considered low-hanging fruit. The first is the need for nested (global/regional/site) particle tracking models. Such models would incorporate the regional and site-specific observational data. The second knowledge gap concerns ocean observations to assimilate into physical oceanographic models, including basic advection structure, background vertical diffusion and variation in circulation over time. These were all considered a very high priority. The third physical knowledge gap identified is the lack of detailed bathymetry. These likely will be collected by contractors and should be made publicly available. However, currently there is no mandate to collect detailed bathymetry in the APEIs of the CCZ, which is required to evaluate their representivity as reserves of biodiversity and ecosystem function in the region. Chemical oceanographic knowledge gaps include background concentrations of some nodule relevant metals. Concentrations of some elements and metals have already been determined by the GEOTRACES program. A synthesis of this chemical information for the CCZ should be assembled. This chemical information is a priority to inform toxicological studies and for assigning thresholds for mining operations. There were a number of knowledge gaps in primary biological knowledge for the midwaters over the CCZ. There is very little information for pelagic communities below the epipelagic, and none from the bathypelagic. Thus, a high priority is to determine the abundance, biomass, diversity, and community structure of deep pelagic communities (gelatinous and crustacean zooplankton, micronekton and nekton) and the spatial and temporal variability of these parameters, particularly in the bathypelagic and benthic boundary layer. These data could be acquired using multi-frequency acoustics (for micronekton and crustaceans), optical survey approaches for gelatinous taxa (e.g. AUV or ROV video transects), and net sampling for hard-bodied forms. It would take several years of study to quantify variability in these parameters across seasonal and interannual time scales. Another high priority is characterization of vital rates and life history parameters such as feeding rates, reproductive rates, generation times, maturation time, size at maturity, and growth rates for a broad suite of pelagic taxa. These rates and parameters are very important for understanding organisms’ sensitivities to disturbance and potential recovery rates. Some of these data can be acquired through conventional analysis of physical specimens (feeding, age and growth, size at maturity, fecundity) but others (e,g. rates of feeding, annual reproduction) are very challenging to ascertain. Major biological data gaps for which measurement was deemed technologically very difficult or perhaps impossible were also identified. One such gap was to determine the effects of particles from mining plumes on suspension feeders. What are the exposure thresholds for sublethal and lethal effects (dose-response effects)? It will be important to evaluate both acute effects (e.g. visible signs of clogging from short-term exposure) and chronic effects (e.g. increased metabolic costs of foraging from repeated exposure). The former would be easier to ascertain, likely deriving from in situ midwater plume dispersal experiments (which were recognized to be very difficult) and ROV observations of suspension feeders. The latter would be extremely difficult and perhaps impossible, as it would require monitoring individuals over days to months. Given the challenges to understanding how plumes will affect suspension feeders, it was concluded that perhaps the only viable strategy would be monitoring changes in abundance of the fauna over time in response to pilot and full-scale mining activities. Because pilot mining very likely will occur over smaller space and time scales than full-scale mining, chronic effects may not be addressable until full scale mining occurs. Another biological data gap identified was the sensitivity of pelagic animals to diminished light. This is very difficult to measure and our current knowledge is based on estimates of visual sensitivity from experiments on animal eyes in the laboratory, and from water-column properties ( Warrant and Locket 2004 ). Some abyssal fishes have large eyes indicating adaptations for greater visual sensitivity. Thus, studies of visual sensitivity should be extended to the animals near the abyssal seafloor. The first knowledge gap that the vents breakout group identified was the spatial and temporal extent (or distribution) of sediment plumes (both near seafloor collector and midwater dewatering plumes). This information is required to evaluate the true magnitude of pelagic ecosystem consequences for mining in vent (or any) regions. The first step for filling this gap is modeling the nearfield sediment plume properties and generation. This step couples naturally with contractor engineering efforts and could result in iterative designs to minimize sediment plume extent. The group also felt that such models needed to be validated with empirical plume tracking studies, including measurements from AUVs, CTD casts, and chemical tracers. Further, in conjunction with sediment plume modeling and empirical tracking there is a clear need to evaluate the nature of the dissolved chemical plumes. As for the sediment phase of plumes, the chemical phase will depend on mining techniques including the grinding and transport of deposits and shipboard separation of ore. The background chemistry in vent regions has been characterized, but there is a chemical knowledge gap, namely how the ground ore and disturbed sediment will leach and weather metals and other compounds into the water column. This information is important to evaluate potential mining impacts from a toxicological point of view. Lab experiments using sulphide deposits could measure leaching and weathering rates. Three important biological knowledge gaps were identified. First, the sensitivities and thresholds to (dissolved) contaminants and suspended sediments/particle loads are poorly known. Initial experiments with vent animals by the MIDAS project provided some insights ( Hauton et al. 2017 ). These studies suggested both synergistic and antagonistic effects of multiple metal exposure. Thus, the group considered that the best approach for future studies would be to evaluate the toxicity of the bulk resource (not individual metals) for a particular mining location. This would involve lab exposure experiments on diverse community components (microbes, phytoplankton, larger organisms). These data could be combined in the form of a “weight of evidence approach” to quantify the relative bulk toxicity of the resource. The group also discussed how, based on laboratory toxicology studies, contractors might work in real time to assess impacts. There are rapid phytoplankton-based assays available that could be used to test the toxicity of discharged waters and their bulk ore leachates, but these tests (e.g. MICROTOX assays) on phytoplankton or microbes may not be relevant to deep-sea taxa. Another biological knowledge gap identified was the in situ determination of microbial activity and how mining will affect it. We have estimates of in situ activities such as oxygen consumption etc. Therefore, there are some pre-existing data in some regions but more is needed and particularly in response to mining plumes. It was thought that the best approach to begin filling this knowledge gap would be incubation experiments coupled with metagenomics. Finally, the group considered the biology of the bathypelagic and concluded that our understanding of this zone is a critical knowledge gap. This system likely will be affected by both near bottom collector plumes and potentially midwater dewatering plumes. Thus, we need to focus research in this region as a very high priority. Some information exists for the Mid-Atlantic Ridge ( Cook et al. 2013, Sutton et al. 2013 ) that is pertinent to mining claims in that region but other regions are wholly unstudied. Contractors may place more baseline and monitoring attention in the bathypelagic if this becomes the zone of discharge but currently contractors are not studying this region. Important parameters include diversity, community structure, food web structure, biogeography (and thus habitat size), and the regions contribution to ecosystem services. The best approach to addressing this knowledge gap was discussed. The group agreed that the ideal combination of censusing approaches would be depth-stratified trawling for hard-bodied zooplankton and micronekton, combined with visual transects to quantify gelatinous and fragile taxa (e.g. ROV, AUV, or towed visual surveys). The seamount group identified characterization of bathypelagic flow around seamounts as an important knowledge gap with relevance to understanding sediment and chemical plume dispersal. Empirical measurements are not technologically limited and could characterize the variability, strength, and seasonality of flow. From the chemical oceanographic perspective, a baseline of trace metal concentrations is a knowledge gap that can be filled. This information is lacking on seamounts though regional values may be available from previous tracer studies. In association with this data gap was a need to have more information on trace metal concentrations of seamount-associated pelagic fauna, particularly species of interest to fisheries. Again these data can be acquired rather easily from commercial fisheries catches. This group concluded that the tracking of plume spread and spatial extent were major information gaps preventing quantitative estimates of the scale of ecosystem damage. The group agreed that this was a universal data gap across the resource/habitat types. A key element for filling this knowledge gap was the need for more logistical information regarding the mining process. Plume tracking is still a technological challenge, particularly in complex flow environments, because the plume may generate filaments or complex shapes. Thus, comprehensive tracking with repetitive AUV or glider monitoring seemed a good approach to take. Another knowledge gap was the ambient sound environment around seamounts. Some passive acoustic data on shallower seamounts exists (e.g. Giorli et al. 2015 ), but data are required on the specific features to be mined. These would be relatively easy to acquire as the passive-acoustic monitoring moorings are commercially available. Indeed, the group wondered if this instrumentation could be paired with other mooring based instruments such as current meters and active acoustic pingers to evaluate midwater biomass and vertical migration behavior over a seamount. Some sound thresholds and impacts on marine mammals are known but there is no information on deep-water fishes. A major biological data gap identified was a quantitative description of the bathypelagic community both within the near-field of the seamount and in the surrounding background community. Such data are available for some mesopelagic seamount assemblages ( Porteiro and Sutton 2007 ), but the bathypelagic is very poorly studied worldwide. Data on the composition and abundance of the fauna would be required and could be garnered with a combination of quantitative net sampling, imaging for gelatinous forms, and a splat camera to measure bioluminescence. It was suggested that a database should be created from trawl caught specimens, including identity and sequence data, to inform future eDNA studies. In addition, shipboard and deep towed (or AUV mounted) bioacoustics surveys need to be conducted to evaluate the characteristics of deep sound scattering layers of organisms. These community characteristics should be evaluated over at least seasonal time scales (and this was considered true across all of the habitat/resource types). When conducting such studies the group felt that for seamounts there should be some focus on the connectivity between the meso and bathypelagic zones and the seamount demersal fauna (such coupling is well recognized from past studies). Further, the seamount associated hyperbenthic or benthopelagic fauna should also be surveyed. These fauna would be part of the near-field midwater assemblages and many members would likely be resident and possibly endemic. Methods to sample these faunas were suggested to be terrain following rather than pre-defined, discrete-depth sampling of the water column, because distance from the seafloor might be the most important environmental determinant. Understanding the sensitivity of gelatinous plankton and detritivores to plumes was considered a major knowledge gap with important implications for understanding how plumes will alter midwater communities. It was also considered a universal knowledge gap across habitats. Though important, this was considered a technologically challenging arena to gain knowledge due to the difficulty of keeping these fragile animals in captivity or conducting controlled in situ experiments. Some headway might be possible through synthesis of existing related studies from riverine, estuarine and coastal habitats. However, it was noted that these fauna and their systems are quite different to those in the deep ocean. The group further concluded that animal sensitivities to environmental disturbance and hence the actual impact from mining was generally unknown and a gap for all taxonomic categories. The group thought that measuring acute impacts would be difficult but possible through monitoring of avoidance reactions, and changes in abundance, for instance. Assessing chronic impacts would be impossible at this stage because such studies would require long term monitoring in situ or require animals in controlled laboratory settings to evaluate effects on vital processes such as age and growth, productivity and metabolism. Finally, the group felt that ongoing efforts by the ISA and scientists to bring together contractor data (e.g. topography, physics, biology and other non-proprietary information from mining claims) and making it publicly available was a key way to further expand our knowledge and refine knowledge gaps. To address these two questions the workshop participants agreed that the most expeditious way to communicate their findings was to read and amend the latest version of the ISA’s LTC recommendations on ecosystem baseline study requirements provided by LTC member Malcolm Clark. It is the hope that this document will lead naturally to monitoring requirements. The document was largely written by those focused on seafloor habitats so this was an opportunity to expand their applicability into the pelagic. The workshop participants broke into the three habitat groups to create edits and comments. These were then synthesized resulting in an aggregated set of edits to the LTC8-revision document itself. These comments were sent to LTC members Malcolm Clark and Gordon Patterson directly on October 8, 2018. During discussions at the workshop, it became apparent that the nature of chemical plumes, as related to but distinct from sediment plumes, needed a separate discussion. The entire group participated. Chris Measures began the discussion with an informal presentation, during which the group asked questions and discussion ensued. He pointed out that the current findings and the knowledge and existing data for the dissolved metals in the deep water are very limited. There are several global programs such as GEOSECS and GEOTRACES ( Schlitzer et al. 2018 ). GEOTRACES, including over 20 different countries, has made great advances in how we collect samples in a metal clean way (which is critical for measurements of these compounds at low concentrations), and how to measure trace metals. For CCZ area, the US GEOTRACES team will collect samples this year (2018) to provide some of the background information of dissolved/particulate compounds as well as suspended loads. Crushed rocks (broken up ore) will expose new surfaces to weathering, thereby exposing new bonds that will be easily hydrolyzed/dissolved. The largest driver of this process is newly exposed surface area. In addition, temperature, pH (which could be low in crushed sulphide ores), and dissolved oxygen are additional drivers. These factors are generally well-known in other systems but not in this context. There was some discussion about the effects of pH. Lower pH results in increasing solubility of the ore materials. We know that while vent plumes add huge amounts of suspended load, vent effluents do not appear to have far-field effects on pH but do lower pH near the vents, affecting the concentrations of metals. Furthermore, high solids to liquid ratios will decrease pH in the fluids, increasing solubility and resulting in an increased flux of dissolve metals and trace elements into the water column. It was a strong conclusion that these leaching processes could be studied in a laboratory setting with collected ore samples specific to the mining area of interest. Measurements of ore dissolution rates as functions of surface area, composition, pH, temperature and pressure, etc., could be determined. The second source of metals and trace elements to the water column will be from pore waters released from the sediments. This situation applies to sediment-covered areas, especially nodule mining on abyssal plains, but also possibly to sulphide/vent mining where there is a sediment overburden to deposits. Seamounts are also characterized by pockets of sediment that may release pore waters. Sediment pore fluids contain high metal concentrations that are the result of diagenetic processes within the sediments. These pore waters will be released to the water column during sediment disturbance/removal. It was noted that Global Sea Mineral Resources (GSR) has studied pore-water chemistry in their claim area in the CCZ. Other contractors, including IFREMER, have also conducted pore-water studies. It was noted by several participants that the chemical signature will persist beyond the particulate plume. The dissolved chemicals from the plumes could provide tracers for both the particulate and dissolved phases because they are longer lived and some are already used as tracers of water masses. Aluminum concentration is a good example because sediments are largely aluminosilicates, and aluminum concentrations are high in pore waters (700 times higher than background levels in the deep water column). In addition, this element has already been used to trace natural bathyal sediment plumes/turbidity flows in the Arctic and the Southern Ocean ( Hatta et al. 2013 ). Elements in the dissolved plume will have much longer residence times than the particulates (i.e. residence time of aluminum in the deep water is 150 y). Thus, dissolved metal concentrations can be used to trace dissolved plumes and mining effects over long periods. The group then had a discussion about what chemical constituents should be measured and how. High priority elements would be those with toxicological effects. Toxic elements include manganese, cadmium and copper for long-term exposure and/or high doses, and mercury and lead due to bioaccumulation. To be accurate, measurements must made with a trace-metal clean CTD rosette for water-column sampling. These systems are expanding in availability. GEOTRACES has a system for loan with a conducting Kevlar cable with polyurethane coating (may be part of UNOLS equipment pool). The R/V Sonne also has such a system which is being used for the JPIO 2 experiment. The UK (Southampton), India and Korea also have such systems. These types of measurements should be available to a range of groups. It was noted that these systems often require a dedicated technician with experience to avoid contamination in collection and in subsampling etc. Pore water sampling could use box cores which are routinely being used by contractors and there are techniques for pore water squeezing. For instance, it is possible to use Peepers – probes for collecting small samples of water along depths in the sediment – and only a few depths need to be sampled to estimate sediment depth profiles of metals. The group also discussed what ancillary parameters need to be measured and it was clear that pH, the redox state, and temperature in the discharge water should be monitored to fully evaluate leaching from the ores. It was noted that contractors should make the density of the discharged fluids greater than or equal to the density of the seawater at discharge depth, possible by adding solids to create a gravity flow, which will help to ensure that the plume is not buoyant and does not spread further in the midwaters. In addition, the group noted that for vent sulphide mining, a process to ensure oxidation of sulphides prior to discharge would reduce chemical oxygen demand and reduce biological stresses. Contractors can monitor the oxygen concentration of the effluent to ensure that oxidation is proceeding appropriately. Discussion then shifted to toxicology and biological effects of dissolved metals. Terrestrially based mine tailing disposal in the ocean have been studied in New Guinea, Norway, Spain and British Columbia. These studies have focused primarily on shallow-water species (perhaps to 500 m depths). The group discussed whether these results could be applied to the deep sea. MIDAS research showed that pressure and temperature are important moderators of toxicity, so it was concluded that LD50s from shallow-water species cannot be applied to species at depth. Temperature and pressure effects are complicated and not predictable. Furthermore, the MIDAS program concluded that tests of toxicity with single metals were not worthwhile due to synergistic and antagonistic effects. Instead, the leachates from bulk ore resources should be studied to address, the full real-world complexity of toxicological effects. The group then addressed a question about whether there could be adaptive management after basic assessment of the bulk resource, such as incorporating shipboard tests such as microtox to evaluate relative toxicity on a daily basis. The thought was that the mineral resources vary in metal content and toxicity across the license blocks and adaptive sampling and management might reduce risk. In such a scenario, the toxicity should be determined at the environmental impact assessment stage and at the start of mining during methods development. However, adaptive approaches would still be tied to estimates of sensitivity and thus require determination of actual stress thresholds, which is problematic. It was noted that no toxicologist would say that some level is non-toxic because of data gaps for chronic effects, making determination of safe levels for long-term exposure problematic. Indeed, the inability to define thresholds may be an issue (legally) for contractors. An additional problem is that it wasn’t clear what action would result from adaptive monitoring of toxicity of the dewatering fluids. If toxin concentration exceeds some threshold level, do contractors further dilute the dewatering plume or move the mining operation to another portion of the license block where the resource is less toxic? To avoid these problems and the great uncertainty in estimating sensitivities, some suggested that the dewatering plumes should be injected below the (epi- and) mesopelagic zone (>1000 m depth), which sustains important levels of biodiversity, biomass, and ecosystem services. Others thought that, because the seafloor system would already be highly disrupted, it would be best to discharge dewatering plumes close to seafloor. This approach would also limit horizontal dispersal of the dewatering plume. It was also noted that “dilution may not be the solution” to mitigation of deleterious plume effects because we do not know the stress thresholds for midwater organism (these are likely be extremely low in the CCZ) and efforts to dilute the plume may dramatically increase its deleterious spatial footprint. The questions above were addressed in a few ways by the group. First, the workshop participants discussed the components of baseline studies leading to monitoring efforts in response to questions 6 and 7 above (ISA LTC recommendations) as input to the guidance for the ISA and contractors. Kristina Gjerde provided an overview of the ISA draft exploitation regulations and noted that these were open for public comment through Sept 30, 2018. We discussed how we as a group might comment on these regulations. Kristina led us through the document highlighting pertinent sections for consideration. She emphasized that there may be a need for pelagic relevant definitions. Below are excerpts from the conversation as Kristina led us through the document. Draft regulation 4: Rights of Coastal States. The group noted that as drafted this regulation was limited to coastal states and to serious harm or threat of serious harm only within that state’s EEZ. It was suggested that such provision could be broadened so that any state could notify the Secretary General if they believe serious harm was occurring anywhere in the Area. It was noted that the concept of the Common Heritage of Mankind by definition applies to all mankind and therefore all states. Draft regulation 21 and 22 provides details of the LTC review of a contractors EIS, Environmental Management and Monitoring Plan and Closure Plan. The group noted that this determination would require multidisciplinary scientific review, analysis and determinations that were likely beyond the capacity of the LTC as currently comprised. The group suggested that an external expert panel review could help to ensure adequacy of the EIS and EMMP and other contractor submissions. Some discussion also followed on whether the terms defined in Schedule 1 of the draft exploitation regulations were appropriate and applicable for the pelagic environment, particularly given the prior focus on benthic ecosystems. Important terms discussed were Serious Harm, Environmental Effect, Marine Environment, and Mining Discharge. The group concluded that these terms were defined in an appropriately general way and applicable to the pelagic ecosystem. However, the references to the open water column under Annex 5: Environmental Impact Statement Template, was deemed to be narrow. Annex 5 section 5.4 states “This section describes the biological environment in the open water from a depth of 200 m down to 50 m above the seafloor and includes zooplankton, mesopelagic and bathypelagic fishes, and deep diving mammals.” The same text appears in section 8.4. The group evaluated this statement and suggested that “mesopelagic and bathypelagic fishes” excluded important invertebrate taxa that are not plankton. We suggest this wording instead be “mesopelagic and bathypelagic micronekton” Micronekton are defined as small but mobile fishes, crustaceans and cephalopods and is a recognized and common term in the scientific literature. The conversation then focused around our inability to predict the scale of effects and to determine sensitivities and thresholds for response of pelagic organisms. Contractors are already considering test mining which we defined as the component testing of deep-ocean mining equipment. This will be conducted in Spring of 2019 by GSR, for instance. Additionally, there have been some past seafloor disturbance experiments that created benthic plumes (synthesized in Jones et al. 2017 ). However, these activities typically last only a few days and fail to replicate the magnitude of effect that a full scale mining operation will have. Most do not include any midwater disturbances because they do not retrieve minerals from the seafloor (e.g. the DISCOL experiments). To address these challenges it was proposed that a “pilot mining” step be added to contractors’ phases of mining in the exploitation regulations. This would occur on a scale similar to full scale mining and for a period of months to replicate a sufficient scale of impact for real evaluation of environmental effects through careful monitoring. The results then could be used to refine management plans. here was also some concerns that this was financially impractical, as it would require a contractor to invest in expensive technology that then may have to be altered by environmental results. The discussion ended with this intractable quandary in mind. Based on the foregoing discussions, the workshop participants developed the following list of conclusions and recommendations. 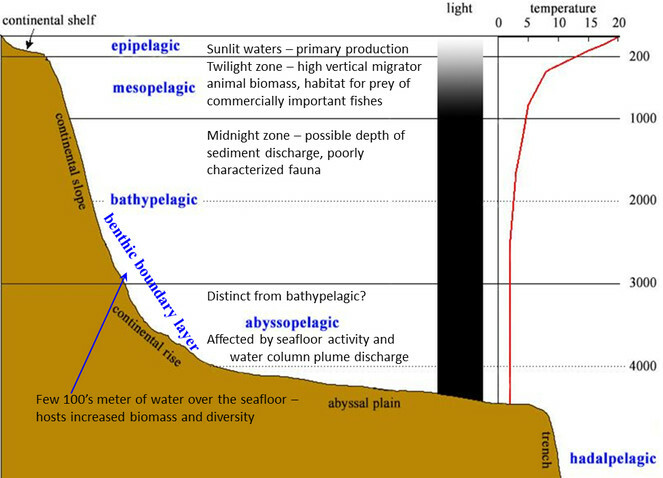 Assuming that mining discharge would not occur in the epipelagic zone (0-200 m), it is preferable to minimize mining effects in the mesopelagic zone (200-1000 m) because of its links to our human seafood supply, as well as the other ecosystem services provided by the mesopelagic fauna. Importantly, dewatering discharge should be delivered well below the mesopelagic/bathypelagic transition, which can contain high biodiversity and serve as local overwintering grounds of high-latitude plankton taxa (e.g. copepods). This transition zone is classically considered to be at ~1000 m depth but it is known to vary regionally. Hence, research should determine what depth is appropriate. Research should be promoted by the ISA and other bodies to increase knowledge of the bathypelagic and abyssopelagic zones (from ~1000 m depths to just above the seafloor). It is likely that both collector plumes and dewatering plumes will impact the bathypelagic, yet this zone is extremely understudied and considered by many workshop participants to contain major unknowns for evaluating mining impacts. For any given geographic region this habitat is large and broadly distributed, extending far beyond the scale of single contractors’ license areas. A cooperative and/or consolidated regional research approach is needed to provide critical ecosystem and community information on regional scales. Management objectives, regulations and management actions need to prevent the creation of a persistent regional scale “haze” (i.e., suspended particle concentrations substantially above background levels) in pelagic midwaters. Such a haze would very likely cause chronic harm to midwater ecosystem biodiversity, structure and function. Effort is needed to craft suitable standards, thresholds, and indicators of harmful environmental effects that are suitable for the pelagic ecosystem. The pelagic fauna are different than the benthic fauna, which have been the focus of mining baseline studies. Pelagic species are often fragile and their sensitivities to some stressors may be higher. In particular, suspension feeders are very important ecologically and are likely to be very sensitive to sediment plumes. These taxa are a high priority for study. Particularly noisy mining activities such as ore grinding at seamounts and hydrothermal vents is of concern to deep diving marine mammals and other species. One way to minimize sound impacts would be to minimize activities in the sound-fixing-and-ranging (SOFAR) channel (typically at depths of ~1000 m) which transmits sounds over very large distances. This recommendation is in accordance with the precautionary principle given our poor understanding of the thresholds of noise effects on pelagic animals. A Lagrangian (drifting) perspective is needed for monitoring and management of mining impacts on pelagic ecosystems. The pelagic realm contains fluid habitats and mining effects are likely to cross license areas due to active animal movements and passive physical processes. Planktonic animals will travel with plumes and could experience chronic exposure perhaps over generations depending upon plume duration and animal generation times. In contrast, the pelagic effects in waters overlying a particular fixed location are likely to be more transient than on the seafloor, because when mining stops, the currents will move the plume away. Therefore, pelagic ecosystem impacts should be considered in the placement of preservation reference zones, in the choice of stations for environmental baseline studies, and in other area-based management and conservation measures. Much more modeling and empirical study of realistic mining sediment plumes is needed. Plume models will help evaluate the spatial and temporal extent of pelagic (as well as benthic) ecosystem effects and help to assess risks from different technologies and mining scenarios (e.g. evaluating effect of discharge depth on plume dispersal). Models should include both near-field and far-field phases, incorporating realistic near field parameters of plume generation, flocculation, particle sinking and other processes. Near field modeling can then set the stage for the inclusion of a far-field phase dominated by passive advection and mixing. Plume modeling should include, for realistic mining scenarios, an assessment of the spatial scales and duration over which particle concentrations exceed background (baseline) levels and interfere with light transmission to elucidate potential stresses on communities and ecosystem services. It is important to note that some important inputs to these models, such as physical oceanographic parameters are lacking and should be acquired rapidly. Plume models need to be complemented by studies to understand effects on biological components by certain particle sizes and concentrations. We thank Ms. Kellie Terada for superb administrative support. We also thank the University of Hawaii at Manoa Presidents house staff for supporting the location of this workshop.